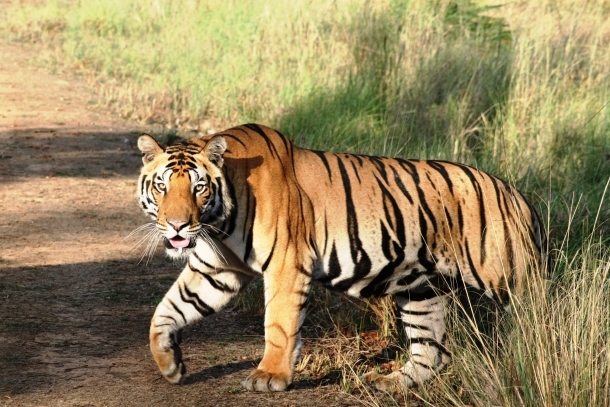 Kanha: The Land Of Tiger..!! Kanha National Park is a national park and a Tiger Reserve in the Mandla and Balaghat districts of Madhya Pradesh, India. The park has a significant population of Royal Bengal Tiger, leopards, the sloth bear, Barasingha and Indian wild dog. The lush Sal and bamboo forests, grassy meadows and ravines of Kanha provided inspiration to Rudyard Kipling for his famous novel Jungle Book . Reach Jabalpur Junction by 6:00 am. Reach Resort by 10:00 am. Check In and Lunch. After Lunch Leave for 1st Jungle Safari. Evening Back to Resort. Dinner and then Rest. Day 2 :Early Morning Have Breakfast and Leave for 2nd Jungle Safari. Back for Lunch. After Lunch Leave for 3rd Jungle Safari. Evening Back to Resort. Dinner. Post Dinner Experience Sharing Session. Rest. Day 3 :Early Morning Leave For 4th Jungle Safari. Check Out. Lunch and Post Lunch Leave For Jabalpur. Visit Bhedaghat and Dhuandhar waterfall. Post dinner leave Back for Mumbai by Mahanagri Exp from Jabalpur. Next Day : Reach Mumbai by 7 pm at CSTM. Train Tickets From Mumbai- Jabalpur and Return.